I’m going to start with a quick apology. I have been so absent from posting because, well… I have been absent from cooking. The past two weeks I have been basically living on cereal and grilled cheese sandwiches. Did you know that if you melt a bit of cheese on your skillet and then put your toasted grilled cheese on top, you get the best crust EVER? Try it – you will never see a grilled cheese sandwich the same again. But, as much in love I am with my new grilled cheese, I can get away feeding Tom that menu option for so long. So I looked over this week’s Gutsy Cook Menu line up and chose the easiest thing in order to stop him from complaining about all that cheese he was eating. I really wanted to make Nigella’s Keralan Fish Curry with Lemon Rice but, it meant that I had to stop at the market. So, I took a quick look at my pantry and instead went with the Spaghetti al Limone option. It has become my new fast recipe. It takes less than 20 minutes to make and if you get gutsy – like I did, then you can add cream, and some chicken and lots and lots of Gruyere cheese and you get a super creamy pasta that tastes like fresh summer. That is for you guys up north - read it again “FRESH SUMMER”. 1 package of fresh spaghetti. Put plenty of salted water to boil for the pasta. In a saucepan, with medium heat, melt the butter and olive oil together; add the chicken (if you are using) and toss. 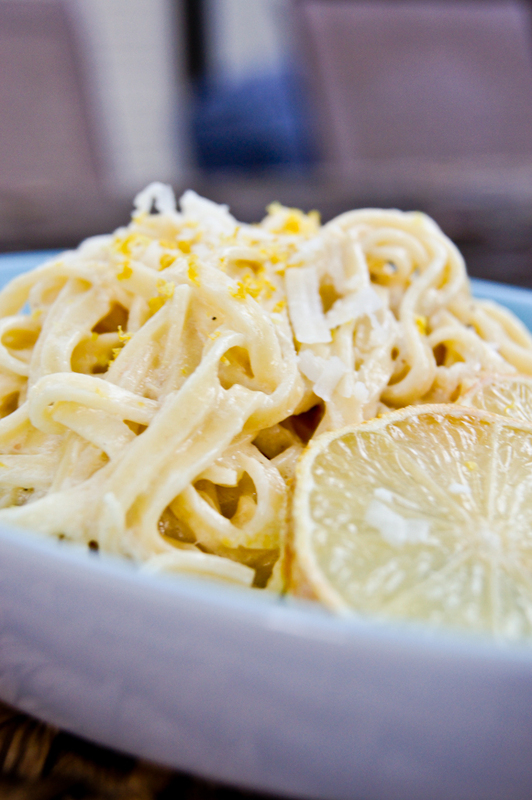 Add the lemon juice and about ½ of the lemon zest and toss around again. Taste and season with salt and pepper. Add the cream and some of the cheese and stir. Lower the heat to low and cook until the cream reduces into a creamy texture. Taste and season if needed. At this point in time, your pasta water should be ready. Add the pasta and cook until “al dente”. When its ready, drain the water and add the pasta to your sauce. Toss around and add the rest of the cheese, the basil and lemon zest. You can ground some fresh pepper on top as well.